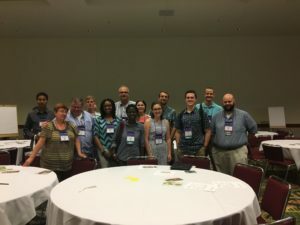 Thank you for attending Plant Biology 2017– here’s your Sunday meeting update! Here is your daily guide to activities curated by our team. When in doubt, you can also check the schedule and the conference app, or stop by Registration and ask one of our friendly volunteers. Start your morning bright and early with Undergraduate Poster Sessions / Mix & Mingle (7 AM–8:30 AM) in the Poster Hall. Grab some coffee and a light breakfast and support the undergrads! Or, if you signed up for the Women in Plant Biology Breakfast, head over to Room 314 (7–8:30 AM) for discussions on career development, opportunities, and challenges for women in science. Sunday afternoon also offers Concurrent Symposia (1:30–3:15 PM), evening poster sessions (5:30–7:30 PM, Exhibit Halls 2 and 3), and a Plantae Demo at the Plantae Pavilion (5:30–5:45 PM, Exhibit Hall 3). Electronic Job Board (8 AM–9 PM, Plantae Pavilion). Pitch Your Science (11 AM–1 PM, Room 319B) Present your research to the world in a 90-second, professionally recorded video (for free). No pre-registration required; first come, first serve. Learn more. Resume reviews / Mentoring Sessions (11 AM–5 PM, Plantae Pavilion). Get your resume reviewed and other career advice from plant science professionals. Sign up at the Plantae Pavilion. Ask Me Anything: Plant Science Careers in Industry (11 AM–1 PM). Phil Taylor (Monsanto), Sreekala Chellamma (Dow), and Graham Wilson (Conviron) will answer industry-focused questions about how to get a job, what the working environment is like, and any other questions you may have. Plantae Demos (11:30, 1:30, 3:15, and 5:30). Learn about creating a profile that helps you get a job, the Plant Science Resource Network on Plantae, networks, live online chats, and much more. Create or edit your profile to receive an exclusive pineapple pin available only at PB17! Selfie Station. Take a selfie and post it on Instagram or Twitter using #PlantBio17. A prize for the best selfie posted during the event will be awarded on Tuesday at the Town Hall Meeting. Draw Your Science (Exhibit Hall 2) and Tool Swap (Membership Desk) will be open each day, all day.